Why Choose the Deaf Studies Program? The Minor in Deaf Studies will provide students with knowledge and understanding of Deaf people, including the culture, history and the language of ASL. The program will provide a cultural and linguistic understanding of the Deaf, while looking at the life of deaf and hard-of-hearing people from a variety of perspectives. 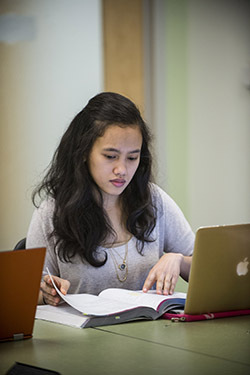 The deaf studies minor complements many major fields of study and prepares students to work in an array of settings where American Sign Language skill and knowledge of the American Deaf community are necessary. The skills learned in this program can benefit students that plan to work in settings such as education, business, human services, social work, health care, counseling, theater and many others. The minor consists of 20 credits and a grade of C or higher is required in all courses taken toward the minor concentration, including the four basic language courses. What the Deaf Studies Minor is not: It is not an Interpreter Education Program or a Deaf Education program. This program does not prepare individuals to become interpreters or teachers of the deaf, rather the minor in Deaf Studies will prepare students to be friends, advocates and allies of the deaf, and enable them to interact with Deaf persons by using American Sign Language.